As greyhound racing slowly ends across the country, Florida has become one of the last places where this cruel industry still exists. The Sunshine state is now home to a majority of all greyhound tracks nationwide, with 13 of 22 operational dog racing facilities. Thousands of greyhounds race in Florida every year. Like racing dogs all over the country, these greyhounds endure lives of confinement and suffer serious injuries. We do not know, however, exactly how many injuries are occurring at Florida tracks, because the state does not require that greyhound injuries be reported to the public. This veil of secrecy allows dog racing promoters to hide the true cost of their cruel business. In light of this lack of reporting, I am struck by investigative records we recently obtained from the Florida Department of Business and Professional Regulation regarding greyhound injuries at Sanford Orlando Kennel Club. According to the information we received, the state has investigated the track at least five times over the past ten months, after greyhounds suffered particularly catastrophic injuries. These state records provide a small glimpse into the greyhound racing industry in Florida. They also tell the story of individual greyhounds who suffered and died at Sanford Orlando Kennel Club. On May 7, 2011 a two-year-old brindle named Gossip was euthanized after she was bumped by other dogs, flipped over, and broke her left shoulder. On April 23, 2011 a three-year-old brindle greyhound named Rumblin Reba was euthanized after she was bumped by other dogs and broke two bones in her left hind leg. On January 7, 2011 a two-year-old white and red greyhound named Boc's Maisie Mae suffered an apparent seizure and died after finishing a race. On January 5, 2011 a three-year-old red brindle greyhound named Crystal B Disco died after she collided with another dog during a race, struck the rail with her forehead, and suffered an open skull fracture. In September 2010, Sanford Orlando Kennel Club veterinarian Bruce Olson euthanized four greyhounds due to injuries sustained on the track in a single month. These records prove that greyhound injuries occur in Florida on a regular basis, and are evidence of why dog racing must end. At long as greyhound racing continues, dogs will suffer and die. In addition to these records, we have also obtained video footage of the final race of Crystal B Disco. Please watch this footage, and then forward it to others. Unfortunately, it is too late to help Crystal. 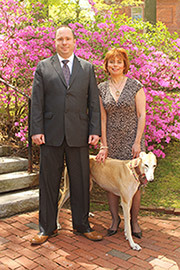 We can help other greyhounds, though, by making sure that as many people as possible know her story. I am eager to fight again next year for a greyhound decoupling bill in the Florida legislature, which will significantly reduce dog racing and help thousands of greyhounds. When the legislative session opens I will be there, and will be thinking of Crystal B Disco and all the other greyhounds who have given their lives for this cruel industry.